I counted the pots - 32 of them. 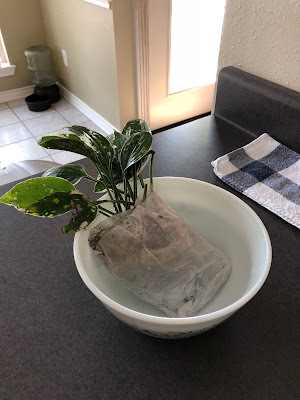 No wonder watering takes a while! 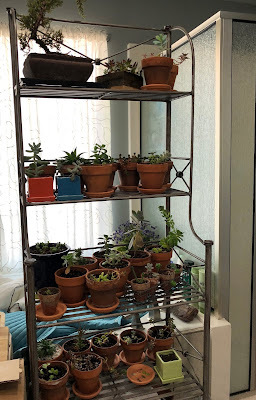 After the renovation I'm going to get a larger pot and try making a grouping from several of these. I did this last year and promptly killed almost everything, but I know what I did wrong now, so maybe this time I'll be successful. Bonus would be having fewer pots and plants to water! Not bad for having gone through the postal system in a padded envelope! I couldn't believe what I was seeing! Color me shocked to see new leaves sprouting! 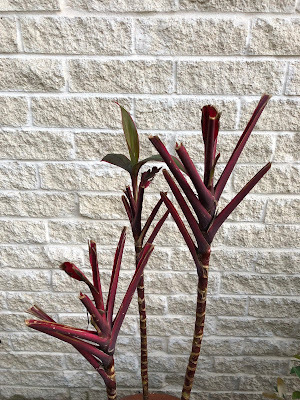 I can see tiny bits of green on the other two stalks as well, so this one will likely get to stay in the front of the house instead of going to the Island of Misfit Plants. Pink blooms, no less! 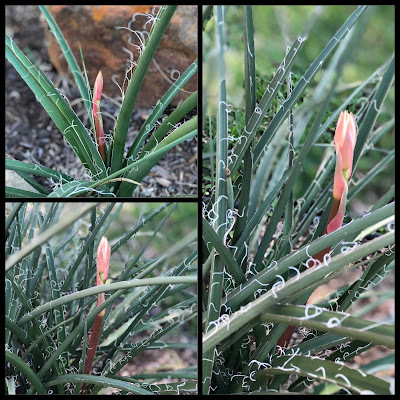 These are the easiest plants to grow here, and I keep telling Jeff we should forget 75% of everything else we try and just plant more yucca. I always feel excited when my orchid starts to bud again! For a few months, it's just a stick and then voila, beautiful blooms! ...and even though I had nothing to do with the blooms, I feel like a proud plant parent, LOL. Yay to the hostess popping up! I love spring when things burst back to life!!! I can't believe that plant made it through the postal service. I have one of those Hawaiaan plants to. It has the most beautiful purple leaves when it blooms. I hope mine comes back this year. I haven't taken the best care of it this winter. 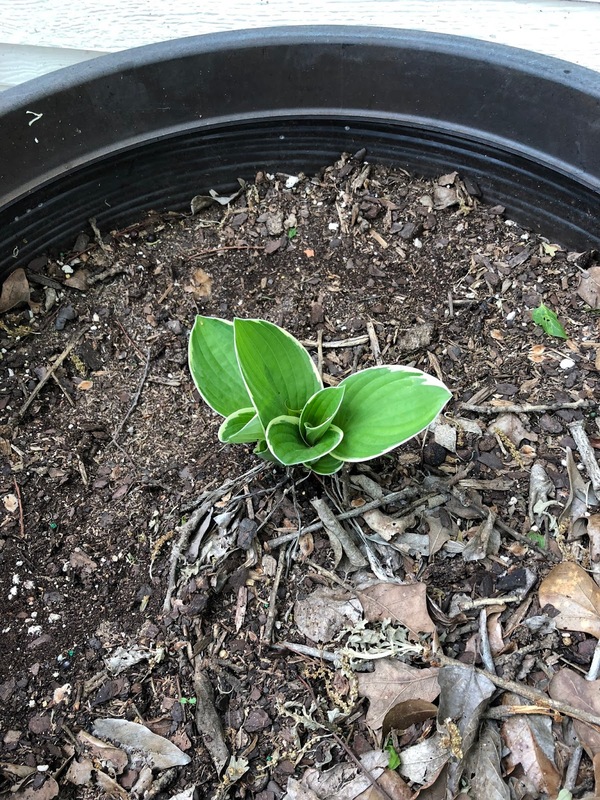 I was shocked when the Hostas came back, and also when the Hawaiian Ti plant sprouted - thought both of them were dead and gone for sure. Wow, that is a lot of succulents! But so great that you are having such good luck with them! 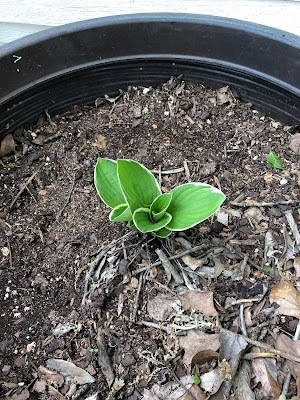 And the hostas. I'm very impressed with your success with them too. I do love my succulents - I've even had some luck with propagating a few and have little succulent babies to show for that, yay! Funny how easy it is to take things for granted. 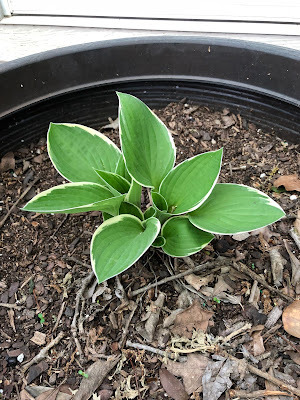 Hostas are everywhere here so the first thing I did when we moved in this house was rip ours out and plant something else! I think we all want what we can’t have - I would kill to have hibiscus. Also, whenever I see succulents I think of you. Which means you must be the Succulent Queen. It's such a treat to see these things sprouting! We haven't seen that here yet! I hope your repotting of the succulents goes well! I always think of you, when I see one, anywhere. Ha. I wish I could garden, it's just not in my DNA! 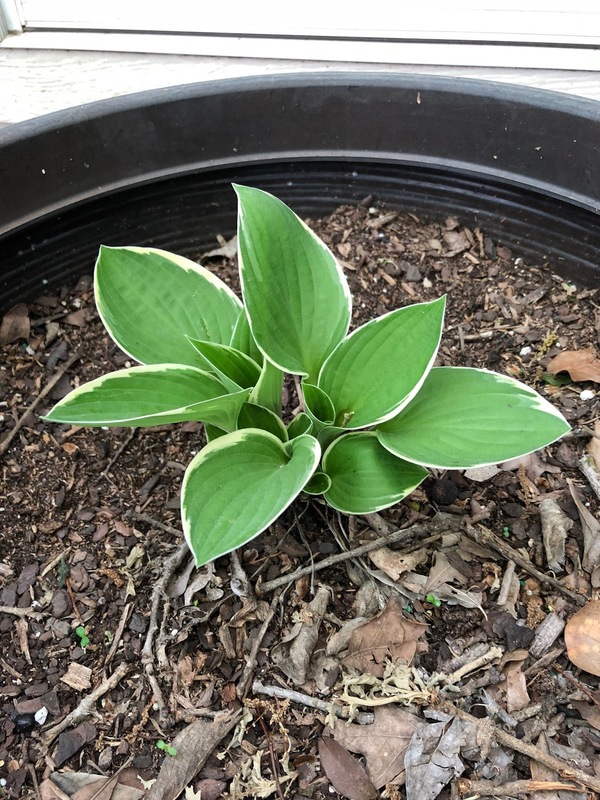 Hostas are my favorite. I have about 8 that grow in the shade under a huge pine tree. 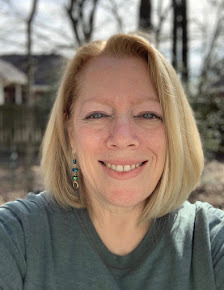 When I start seeing them sprout, I know that spring is here! I so wish I had the time to garden. I love flowers and plants.